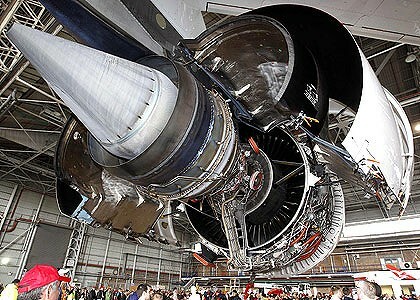 Rolls Royce now faces direct costs for replacement of 40 Trent 900 engines, compensation claims from Airbus and from the airlines involved and lost opportunity costs as the Trent 900 inevitably loses market share to the General Electric / Pratt & Whitney Alliance GP 7200 engine. These could add up to around 300 million $ for fixing the Trent 900 problems and that is a best case scenario which assumes that they have not been negligent in knowingly supplying unfit engines. The cost of the consequent loss of market share cannot be easily quantified. Airbus has already signalled that it is preparing its compensation claims for the additional costs incurred by diverting new engines from the Airbus production line to the replacement of faulty engines for Qantas, Singapore Airlines and Lufthansa. Any consequent delays to the aircraft under production at Airbus will no doubt lead to further penalties for Rolls Royce. The airlines are also, I am sure, preparing their compensation claims. Qantas is said to be losing one million dollars for every day without its A380’s. The fleet has been grounded for 15 days so far and it seems likely that this may last another 2 or 3 weeks and maybe for the rest of the 2010 calendar year. Qantas has already prepared its summer schedules based on no A380’s being available. Singapore Airlines has restarted its A380 flights. In most supply contracts the consequential business losses at the airlines would not normally accrue to Rolls Royce but if it can be shown that the faulty engines delivered by Rolls Royce were “not fit for service” or – even more damagingly – that Rolls Royce were aware of the faults when the engines were delivered then Rolls Royce could be liable for massive damages and even for criminal negligence. In fact it would be comparable to issuing a cheque with no money in a bank account which could be construed as criminal negligence and fraud. Certainly it seems that Rolls Royce has known for some time that some of the engines delivered were “not fit for service” and it is highly unlikely that they could completely escape paying some compensation to the airlines. If the method of operation or maintenance by Qantas could be shown to be a contributory factor then Rolls Royce would have had some possibility of resisting the claim and of mitigating the penalties. But if the engines were “unfit for service” to begin with, then it even becomes possible for Airbus and the airlines to make claims for “loss of reputation” in addition to claims for loss of business. There is no viable defence at all if Rolls Royce knowingly supplied unfit engines. A Trent 900 engine has a price of about 30 million $ and a complete A380 sells for about 320 million $. The direct cost for the engine rectifications for 40 engines is likely to be around 100 million dollars and this could easily increase to 300 or 400 million dollars with the compensation claims mainly from Airbus and Qantas. The Singapore Airlines and Lufthansa claims for compensation will not be small but will be significantly lower than the claims from Qantas. But if Rolls Royce has been negligent- whether criminally or not – then all bets are off and I think costs could escalate to be of the order of one billion dollars. While the direct costs and compensation – once settled – can be quantified, the effects of loss of market share is potentially even more damaging but much more difficult to quantify. Since there are only 2 engine suppliers I would estimate that Rolls Royce will lose at least 5% market share to its rival as a consequence of this incident. From my previous knowledge of the costs of fixing problems with land based gas turbines (more than 1 billion $ each for General Electric with their F-class Frame 7 and Frame 9 machines and for Alstom and Siemens with their versions of F-class machines), I would be looking for Rolls Royce to provide – as a matter of prudence – for at least 200 million £ (300 million $) during this quarter. Rolls Royce will need to sell around 100 new engines just to recover this cost. From an investor perspective I find the lack of communication from Rolls Royce inexplicable and suggestive that there has in fact been some negligence. SHRAPNEL from the engine explosion on Qantas QF32 severed a fuel pipe and narrowly missed the wing’s fuel tank, according to official preliminary reports. The chief executive, Alan Joyce, also confirmed yesterday that as many as 40 Rolls-Royce Trent 900 engines fitted to A380 superjumbos worldwide might have to be replaced. The reports, seen by the Herald, of the damage incurred on November 4 reveal the extent to which metal components tore through the wing. The debris severed wiring looms, chopping a main fuel pipe, puncturing structural spars and ribs and punching through wing surface panels. Qantas was ”very, very lucky” that thousands of litres of highly flammable jet fuel in the wings did not ignite from the ruptured fuel pipe or from a spark from severed wiring, said Adrian Mouritz, the head of aerospace and aviation engineering at RMIT University. ”If that fuel ignited, that aircraft would have exploded,” he said. Qantas and Rolls-Royce are still ”days away” from identifying which engines might have to be replaced. The engine maker had kept the airline and Airbus in the dark about two series of production changes to the engine’s internals. ”What Rolls-Royce have done is that they have modified certain parts of this engine. We and Airbus were not aware of it,” Mr Joyce said. The questions for Rolls Royce are multiplying and their lack of communications is astounding. Not only, it seems, did Rolls Royce know about the risks of engine failure before the Trent 900 exploded on QF32, but they have also modified the engine and quietly started introducing the modifications without Qantas and Airbus being aware of the significance or the risks with the unmodified engines!!!!! I posted a few days ago that Rolls Royce would need to change out about 40 of the Trent 900 engines on the A380’s in operation with Qantas, Singapore Airlines and Lufthansa. Up to half of the Rolls-Royce engines of the type which disintegrated on an Airbus superjumbo this month may need to be replaced by the three carriers in Australia, Singapore and Germany, Qantas’s chief executive has said. Australia’s Qantas, Singapore Airlines and Germany’s Lufthansa fly A380s powered by four giant Rolls-Royce Trent 900 engines, with a total of 80 engines on 20 planes. Qantas chief Alan Joyce said that Rolls-Royce had indicated that up to 40 of them may need to be replaced. “Rolls-Royce are still working through the criteria for which engines need to be changed,” he said on the sidelines of an event in Sydney unrelated to the A380 incident. He said that 14 of the 24 engines on Qantas planes may have to be replaced. Whether Rolls Royce knew about the engine fault and the consequent risk prior to the accident on QF32 remains unanswered and whether the European Regulator (EASA) relaxed its inspection frequency Directive in response to Rolls Royce representations also remains unanswered. The diagnosis of the problem with the Trent 900 has come in a matter of days and the solution has already been identified and is under implementation. This convinces me that the problem was already known and so was the solution. There are at least two important ethical questions which are raised by the Trent 900 story. 1. The European Aviation Safety Agency (EASA), in August, apparently relaxed a directive regarding the frequency with which Trent 900 engines were to be inspected. The Directive had been issued originally in January. That in itself should primarily be a technical judgement call and judgements – especially in hindsight – can always be found to be faulty without raising any issues of ethics. However the ethical issue arises if – as it seems to be – the relaxation in August was initiated by representations from a party (Rolls Royce in this case) who found the original directive too onerous. The ethical standards of both the Regulator (EASA) and of the petitioner (Rolls Royce) then give cause for concern. 2. The second ethical issue arises if Rolls Royce knew in advance of the accident to the engine on QF32 that the engines in use were at risk and that the consequences could have been catastrophic. If this was just a judgement of the probability of failure and that this probability was judged insignificant then it is an issue of bad judgement but not unethical. But an insignificant probability of failure should not have initiated the programme of engine modifications that was apparently ongoing even before the accident. Therefore, if Rolls Royce, knowing full well that the risks were sufficiently high to require that the engines had necessarily to be rectified, kept quiet in the “gamble” that no accidents would occur before they had managed to modify all the “faulty” engines, then it becomes a case of low ethical standards and not just poor judgement. Reports suggest that Rolls Royce knew that the modifications were necessary more than a year ago but also that the mechanic who revealed this was forced to speak anonymously. This does not give any confidence that there is full transparency and, in fact, strengthens the view that Rolls Royce knew there was a problem. The speed (days rather than months) with which the diagnosis has been made and the solution defined also indicates that the engine failure did not come as much of a surprise and that the problem and the solution were already known. The mainly technical issues with the engine indirectly raise a more general question for the aviation industry of whether there are conditions where competitive pressures can be damaging because they increase the risk of potential harm to the general public (who unwittingly become guinea pigs for testing new technologies). The European Aviation Safety Agency have released Emergency Airworthiness Directive (EAD) 2010-0236-E requiring operators of Trent 900 engines to perform inspections of their engines. The Directive is applicable to the following engine variants: RB211 Trent 900 series engines, variants RB211 Trent 970-84, RB211Trent 970B-84, RB211 Trent 972-84, RB211 Trent 972B-84, RB211 Trent977-84, RB211 Trent 977B-84 and RB211 Trent 980-84, all serialnumbers.These engines are known to be installed on, but not limited to, AirbusA380 series aeroplanes. Reason: An uncontained engine failure has recently occurred on a Rolls-RoyceTrent 900 involving release of high energy debris and leading to damage to the aeroplane.Analysis of the preliminary elements from the incident investigation showsthat an oil fire in the HP/IP structure cavity may have caused the failure ofthe Intermediate Pressure Turbine (IPT) Disc.This condition, if not detected, could ultimately result in uncontained engine failure potentially leading to damage to the aeroplane and hazardsto persons or property on the ground.For the reasons described above and pending conclusion of the incidentinvestigation, this AD requires repetitive inspections of the Low PressureTurbine (LPT) stage 1 blades and case drain, HP/IP structure air buffercavity and oil service tubes in order to detect any abnormal oil leakage,and if any discrepancy is found, to prohibit further engine operation.The requirements of this AD are considered as interim action. If, as a result of the on-going incident investigation, a terminating action is later identified, further mandatory actions might be considered. (1.2) Inspect the Low Pressure Turbine (LPT) stage 1 blades andcase drain. (1.3) Inspect the HP/IP structure air buffer cavity and oil service tubes. (2) If any discrepancy is found during the inspections required by paragraph (1) of this AD, any further engine operation is prohibited. Within one day after the accomplishment of the inspection, report the findings to Rolls-Royce. (3) Inspections accomplished in accordance with the content of NMSB72-AG590 before the effective date of this AD, are acceptable to comply with the initial inspections required by this AD. (4) After the effective date of this AD, do not operate an engine on an aeroplane unless it has been inspected in accordance with the requirements of this AD. “Disassembly of the No. 1 engine revealed evidence of heat damage and distress in the HP/IP turbine bearing chamber consistent with the presence of an oil fire. Microstructure examination of the fracture surfaces on the IP turbine disk drive arm revealed damage consistent with a localized fire that caused the drive arm to eventually fail and separate, allowing the IP turbine disk to overspeed. The overspeed condition resulted in the liberation of all IP turbine disk blades through the IP turbine case, with some blades striking the airplane. Because thermal damage within the HP/IP turbine bearing chamber and associated hardware prevented identifying the exact cause of the fire based solely on the physical evidence from the No. 1 engine, the No. 2 engine was examined to help establish possible causes or contributors to the bearing chamber fire in the No. 1 engine. The 3 Trent 900 engines that Qantas had earlier been thought to have been investigating now seems to have grown to 4 engines – 2 in Sydney and 2 in Los Angeles. These engines were tested following a Rolls Royce recommended 8-hour test procedure but have now been taken off the wings of their aircrafts for further investigation. These are in addition to the Trent 900 which exploded on the A 380 which returned to Singapore and the RB 211-524 on the Boeing 747-400 which also returned to Singapore when an engine failed. MORE Qantas A380 jet engines are out of service and undergoing further tests, the airline says. Qantas spokeswoman Olivia Wirth said two of the Rolls-Royce built engines were in LA. “There are some engines being subject to further tests, but in line with normal procedure,” Ms Wirth told ABC radio today. Fairfax newspapers today reported that Qantas had found issues with three more Rolls-Royce jet engines on its grounded Airbus A380 fleet. They also reported that two engines – one in Sydney and one in LA – had been taken off for closer inspection as a result of the eight-hour tests Rolls-Royce recommended. “Deeper inspection could be for a number of things,” Ms Wirth said. Qantas says it has found problems with more of its A380 jet engines overnight, dashing hopes of an early return to service for the massive aircraft. Ms Wirth says Qantas hopes to have its A380 aircraft back in action in the next three days. The Age reports that Qantas has removed three more Rolls Royce Trent 900 engines on A380’s parked in Sydney and Los Angeles after putting them through 8 hour tests recommended by Rolls Royce. QANTAS has found issues with three more Rolls-Royce engines on its grounded Airbus A380 fleet that have required their removal from the wings, dashing the prospect of an early return to the skies. Two of the engines taken off for closer inspection were on an A380 parked in Sydney and one is from a craft in Los Angeles. They were removed after the eight-hour tests Rolls-Royce recommended for each engine after the fleet was grounded. The airline has one A380 in Singapore under investigation, one in Germany for servicing, one in Sydney and three in Los Angeles undergoing checks in the wake of the mid-air engine explosion last Thursday. While Qantas will not say what the nature of the engine issues are, or whether the three engines are being examined for the same or different matters, the concern was sufficient to warrant their removal from the wings. There is a disturbing silence from Rolls Royce and also from Singapore Airlines and Lufthansa who with Qantas use Trent 900’s on their A 380 aircraft. Does the fault lie with Rolls Royce or with the RR / Qantas combination? Between August 30th and November 5th there have been at least 4 engine incidents involving a Rolls Royce engine causing a shut down of one engine and an emergency landing. September 28th, SQ 333, A380-800, RR Trent 900 engines, returned to Paris after one engine failed, two and a half hours after take-off. 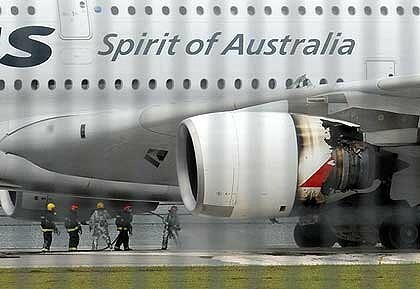 November 5th, QF6, Boeing 747-400, RR RB 211-524 engines, returned to Changi, Singapore after one engine failed shortly after take-off. Four incidents with engine failure in just over two months is quite out of the ordinary. All incidents involve Rolls Royce engines, three incidents involve Qantas aircraft, two were with Airbus A 380 aircraft and two with Boeing 747-400 jets. All of the incidents were soon after take-off (though the Singapore Airlines incident was 2.5 hours after take-off). Two of the incidents were “uncontained”, catastrophic engine failures (both Qantas) and the other two engine failures involved – by witness accounts – oil leaks and/or fires but no “uncontained explosions”. It is not clear whether in the latter 2 cases the engines were shut down or failed. The proximity to take-off suggests maintenance issues but two different airlines were involved (though it seems that Rolls Royce are still responsible for maintenance of the A 380 Trent 900 engines). Rolls Royce engines are used by many airlines and on many different aircraft types. It appears therefore that aircraft type is not the issue. the Rolls Royce Trent/ Qantas combination seems particularly prone to incidents. In order of probability then the engine failure issue would seem to be caused by a Rolls Royce Trent design fault (which has then been introduced also into some of the RB 211-524’s powering the B747-400s), or some fault arising from the Qantas / RR Trent combination, or a maintenance issue specific to Rolls Royce’s maintenance organisation or a more general maintenance issue. It is a tribute to engineers and engineering and safety standards that these 4 incidents led to no injuries whatever and were followed by perfectly safe landings even after the loss of one engine. But a little more communication and information from Rolls Royce is called for. Singapore Airlines is also very tight with releasing any information about its incident. It is insufficient and inappropriate for Singapore Airlines to brush it off as a non-event. Lack of information only suggests something is being hidden. And what of the Trent 1000 for the Boeing Dreamliner?